How to play 1080p or 720p MKV movie on iPad Air? 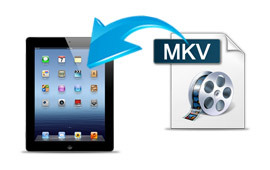 The article will share you an effective and fast way to play MKV files on iPad Air by converting MKV to iPad Air playable video format on PC/Mac. The iPad Air starts shipping November 1st for $499. Is it worth the upgrade? Get frustrated? Here you’ll find the best solution. The reason you cannot get MKV videos working on iPad Air is simple: the default and downloaded IOS Video player on the iPad Air cannot find a suitable decoder for the codec in the MKV file. From Apple iPad Air product page, you will know that video formats supported by iPad Air are limited, it only supports H.264/MPEG4 codec MP4, MOV and M4V format, the other formats like MKV, AVI, WMV, MTS, TiVo, FLV are all not supported, even if you have transferred them to iPad Air, the tablet can’t recognize these files. To solve these problems, a great method is to convert MKV to iPad Air compatible video formats along with some help from third-party tools. To achieve your goal smoothly, here i will take the all-in-one Pavtube iPad Air Converter as an example to show you how to encode MKV to MP4 for viewing on iPad Air. The equivalent Mac version is the imedia Converter for Mac, which can convert MKV to iPad Air on Mac OS X (Mountain Lion and Mavericks 10.9). Below is a simple how based on Windows screenshots. 1. Download, install and launch the Video Converter for iPad Air. 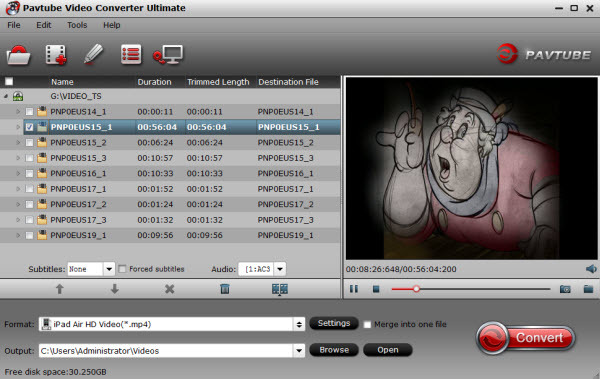 And then click “Add Video” or “Add from folder” to import your source materials in .mkv format. 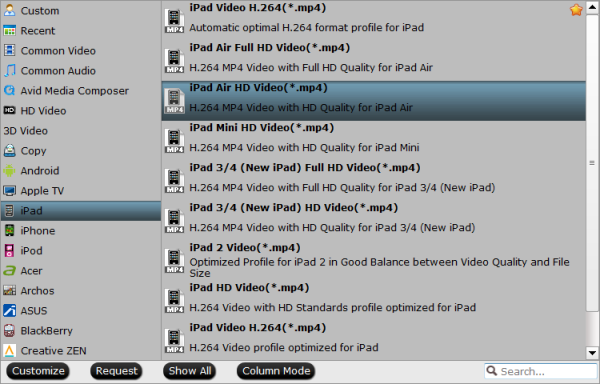 Besides MKV, you can also load FLV, AVI, WMV, VOB, TiVo, MPG, MOV, etc. files to the program. Batch conversion is supported so that you can add multiple files. 2. Click “Format” bar, you can get the optimized videos for iPad Air under iPad > iPad Air HD Video(*.mp4). The output videos could fit on your device perfectly. To get the preset, you should also install the Patch in advance, but now only windows version have the patch file. To get 1080p video quality, just choose iPad >iPad Air Full HD Video(*.mp4). The supported resolution of iPad Air goes up to 1080p, though video playback and most apps never break out of 720p. For watching videos on iPad Air, 720p with 1500~2500kbps is just all right. I found bitrate higher results in big file size, and lower visible quality loss, and vice versa. 3. In the end, go back to the main interface and click the “Convert” button to start converting MKV to iPad Air MP4 videos. Click “Open” to find the result MP4 videos after the conversion and transfer them to your device with ease. After getting the converted movies files, you can transfer them to new iPad Air via iTunes. Prette simple. Now, you can enjoy and view 1080p/720p mkv movies on iPad Air anytime everywhere for great digital fun.